Studies assessing the contribution of non-BRCA1/2 gene mutations to inherited breast cancer (BC) predisposition consistently reported low (up to 4%) yield. 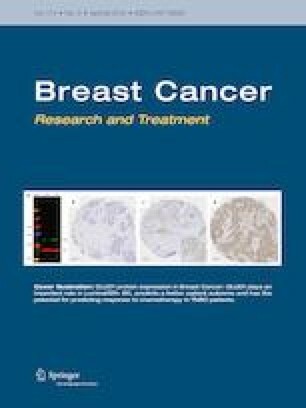 The current study aimed at assessing the spectrum of non-BRCA mutations in unselected Israeli BC cases and the utility of BRCAPRO and Penn II models, as tools for prediction of detecting non-BRCA1/2 mutations in Israeli BC patients who tested negative for the predominant Jewish BRCA1/2 mutations. All consecutive Jewish Israeli BC patients at the Sheba Medical center who tested negative for the predominant BRCA1/2 mutations and elected to perform multigene panel testing were included. For each patient probability of BRCA mutation detection was calculated by the Penn II algorithm and the BRCAPRO tool. Overall, 144 cases were included (median age at diagnosis was 48, range 20–73 years); 48% were Ashkenazim. One patient harbored a non-founder BRCA1 mutation (c.5434C>G; p.P1812A). Pathogenic/likely pathogenic (P/LP) mutations in non-BRCA1/2 genes were detected in additional 14/144 patients, including CHEK2 (n = 5), RAD51D (n = 2), MSH6 (n = 2), and one each in ATM, RET, TP53, NBN, and BAP1. Using a cutoff of 15% probability of BRCA mutation detection, both models accurately predicted the observed carrier rate of non-BRCA mutations. In unselected Jewish Israeli BC patients, the rate of detecting non-founder BRCA1/2 mutations is low, with CHEK2 mutations detected in 3.4% of cases. BRCA1/2 mutation prediction models may be utilized for selecting patients eligible for further multigene panel testing after exclusion of predominant BRCA1/2 mutations. All procedures performed in this study were in accordance with the ethical standards of the institutional and/or national research committee and with the 1964 Helsinki Declaration and its later amendments or comparable ethical standards.